Pass in Graduation / Post Graduation (Sciences / Social Sciences / Humanities disciplines) with 50% and above aggregate marks. 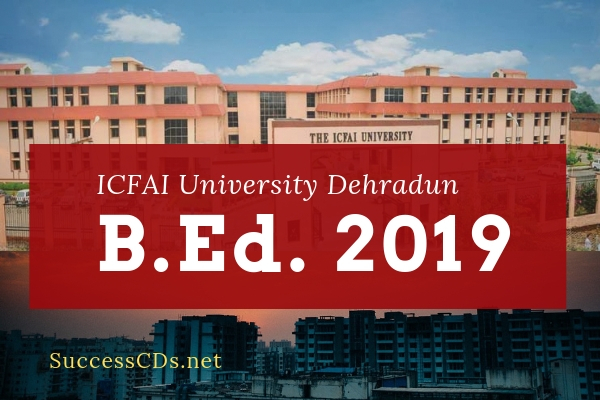 Students who successfully complete the B.Ed Program are awarded the Bachelor of Education degree by the ICFAI University, Dehradun subject to University regulations. The admission into the programs is on the basis of Merit, through Application and Interview. While evaluating students for admission, due weight age is also given to their academic distinctions, awards in sports/cultural events, debates, quizzes and other extracurricular activities. Original certificates of educational credentials and domicile status certificate should be produced for verification at the time of payment of first semester fee. The original certificates will be returned after verification. Applicants can fill their details online and download the Application Form from www.iudehradun.edu.in and send it to the Admissions Office along with the Demand Draft of Rs. 500 towards the cost of the application in favor of "The ICFAI University, Dehradun - Fee Collection A/c" payable at Dehradun.